Therapy by Sebastian Fitzek – It's Time to Read! No witnesses, no evidence, no body: Star psychologist Viktor Larenz’s twelve-year-old daughter, Josy, who had suffered from an inexplicable illness, has vanished under mysterious circumstances during a visit to her doctor, and the investigation into her disappearance has brought no results. Four years later, Viktor remains a man shattered by this tragedy. He has retreated to a remote vacation cottage on a North Sea island, where a beautiful stranger named Anna Glass pays him a visit. She claims to be a novelist who suffers from an unusual form of schizophrenia: all the characters she creates for her books become real. While writing her most recent novel, Anna has been tortured by visions of a little girl with an unknown illness who has vanished without a trace, and she asks Dr. Larenz to treat her. Viktor reluctantly begins therapy sessions with the stranger, but very soon these sessions take a dramatic turn as the past is dragged back into the light. What really happened to Josy? Do Anna’s delusions describe Josy’s last days? And is Larenz a danger to himself and others? 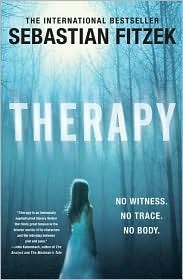 Therapy is an absolutely gripping psychological thriller, an intelligent, fast and furious read that will stay with you for a long time after you have followed Viktor into the depths of his own psyche, and have figured out who Anna Glass really is. I received this book as part of a bookring, and I loved it! This is not the sort of book I generally read and was therefore apprehensive about whether or not I would like this book. As it happened, I thought it was incredible. Dr Viktor Larenz is a renowned psychologist, but when we meet him he is strapped down in a mental hospital because of the mysterious events that happened to his daughter and the effect they had on him. Josy, his daughter had been suffering from a disease the doctors couldn’t diagnose when she goes missing. One minute she is in the waiting room, the next she has vanished. The search for her has revealed nothing, and distraught Viktor goes to stay a cottage on a remote island. It is there he meets Anna Glass. She is a patient wanting his help, because what she writes about in her novels then comes true. And she has created a story about a girl who goes missing. Is this girl Josy? Can Anna help Viktor find Josy? The plot and pace of this book were exceptional. I had no idea what the twist was going to be. Every time I thought I had it sussed, something happened which meant my theory fell through. Fitzek keeps you guessing right up to the end, and the suspense and drama make for a great read. Strange things happen, and the atmosphere is built dramatically and well while Viktor is on the island – especially as Anna keeps appearing from nowhere, then disappearing, then being armed and so on.I found the descriptions of the island easy to grasp, and as I sit here writing this review I can still picture the cottage and the events that went with it. I was convinced by the characters and draw into the story. I felt so sorry for Viktor and everything that ails him in this story. It seemed like at every turn he was defeated but he seemed to keep going. I found Anna fascinating. She was odd, her stories raised questions and led me down the wrong road and kept me gripped the whole way through. I can’t think of a bad thing to say about this book. I didn’t guess the twist, but it was very good and satisfying. I lent this to my Mum and she read it in a day and loved it too. Although this is completely different to my usual genre choices, I really enjoyed this book and was glad I picked it up. It is fast paced, it is exciting and it is a great story. I will be looking out for more books by Fitzek – I really hope more get translated. This is a must-read book. Next Next post: Trip to the library! Just read your review on Therapy. Sounds exactly like the type of thriller that I enjoy. Luckily, I found a copy on PaperBackSwap, so should have it in my hands before to long. Thanks for the recommendation. I imagine I’ll be up late finishing it as it sounds the type that will not let go till the last page is turned. Pingback: This Girl is Different by J J Johnson « BCF Book Reviews – Love books? Review books! Sounds good enough for a movie. Thanks for the review, I’ll look it up in the bookstores.